We ought to understand what it means to worship God, for such worship is our duty. It comes from the fact that God created us, keeps us in existence, and that we are completely dependent upon Him. God made us free willed, rational, creatures “to show forth His goodness,” and we do this by uniting our free wills with His will and by worshipping Him. The obligation, and the virtue by which it is fulfilled, are both called “religion”—a word very likely derived from the Latin “Religare” meaning to “ re-connect” to the divine–from Latin re (again) + ligare (to connect, as in English ligament. It is called “natural religion” if we know it only through unaided reason; and “revealed religion” if it is made known to us more directly by God or through His Church. This implies that the worship of God is incumbent upon all men and women, even if they have not had the benefit of the Judeo-Christian revelation. It can be in the form of prayer—the lifting up of the mind to God to adore, thank, appease, or petition Him. It may be expressed in our good works—done in conformity with God's will, with the intention of glorifying Him. It may be in the form of sacrifice—returning to God those things which are precious to us, as a demonstration of our love and good will. God Himself gave us the perfect sacrifice, when, acting as both priest and victim, He offered Himself on the Cross. And, He gave us the means to renew this sacrifice in time and place through the activity of His ordained priests offering the eucharistic sacrifice of the Mass. This is why the Mass is the perfect for of worship; surpassing all manmade forms. In fact, the Mass (and the Sacraments, which derive from the same redemptive act of the Cross) combine the aspects of prayer, good works, and sacrifice into one divinely unified system. 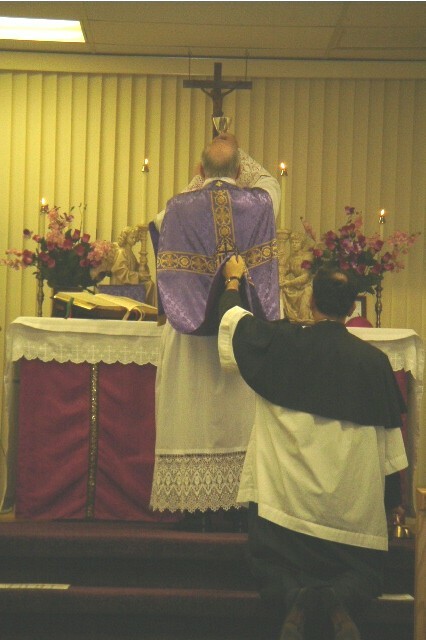 As Catholics, our worship should, therefore, center around the Mass and the Sacraments—frequent attendance at Mass, Confession and Holy Communion. But, quite in addition to our public worship, there should also be a place in our lives for private, meditative, prayer—a few Paters and Aves, a rosary, or perhaps something less structured. We need this private prayer to become more intimate with God—to know Him in a familiar and personal way. And, of course, both private and public worship should be frequent and regular—not just a Sunday morning affair. It should be clear that God Himself has given us instructions about how He wishes to be worshipped. He has given us formal prayers like the "Our Father," told us to ask Him for the things which we need, and established the essentials of the Mass and Sacraments. It would be a mistake—indeed a sin—to revert to the forms of natural religion, or previous revelation. We are no longer to worship the forces of nature, or to offer the animal sacrifices of the Mosaic Law. We must not even participate in supposedly Christian worship which denies the reality of the Mass, or the Real Presence, or which undermines any of the truths of God's revelation. We may cooperate with other Christians in their good works, but must not join with them in formal worship if—as is likely—our Faith will be compromised. Worship is due only to God. We may give a certain amount of honor (usually, we speak of “veneration”) to the Saints—particularly to the Blessed Mother of God, and we may ask them to intercede with God for us—but we never offer them the worship which is God's right alone. Of course, it is a nonsensical thought to think that we are urged to worship statues or paintings—they are on hand simply to remind us of the Saints; and ultimately of God and heavenly things. However, in one sense, it can be said that when we honor the saints, we are offering worship to God, for we are expressing our admiration of those who have most perfectly united their wills to God. In using them as models for imitation, we draw closer to the Divine Will ourselves. In summary, we have the obligation to worship God. We owe Him everything that we are; everything that we ever will be; everything that we have; everything which we can ever desire to possess. He has given us the perfect means for this worship: the Mass, the Sacraments, our Good Works, our private and public prayer. Epistle: Philippians iii: 17-21; iv: 1-3.